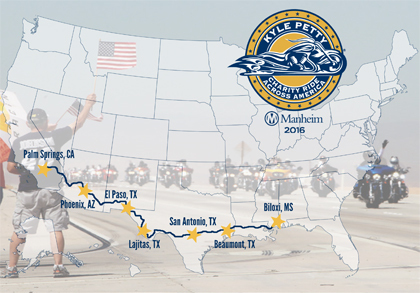 The Kyle Petty Charity Ride Across America, one of the most successful and popular charity rides in the country, is revving up for its 22nd anniversary motorcycle trek, taking place from April 30 to May 6. Former NASCAR driver and NBC Sports racing analyst Kyle Petty will lead 200 bikers on a 2,150-mile route, traveling from Palm Springs to Biloxi, to raise funds and awareness for Victory Junction – a camp dedicated to providing life-changing camping experiences for children with chronic or life-threatening illnesses. 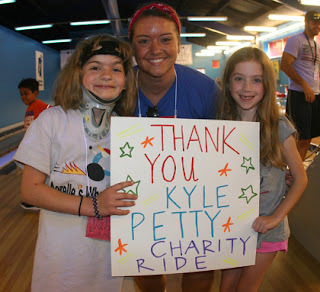 As a result of the Ride, more than 7,880 children have attended Victory Junction at no cost to their families. The camp has served as the Ride’s primary beneficiary since its establishment by Petty and his family in 2004 in honor of his late son, Adam. “Cruising the open road with friends who become family is incredible, but helping to create life-changing opportunities for children is what makes the Ride truly one of the most popular motorcycle rides in the country,” said Kyle’s father Richard Petty. For more information about the 22nd Anniversary Kyle Petty Charity Ride Across America or to make a donation, please visit www.kylepettycharityride.com. 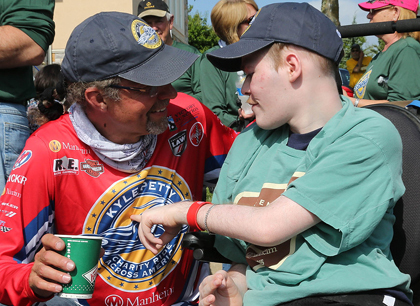 Led by former NASCAR driver and racing analyst Kyle Petty, the Kyle Petty Charity Ride Across America is an annual cross-country motorcycle trek that raises funds and awareness for Victory Junction. The Ride is one of the most successful and popular charity events in the country. 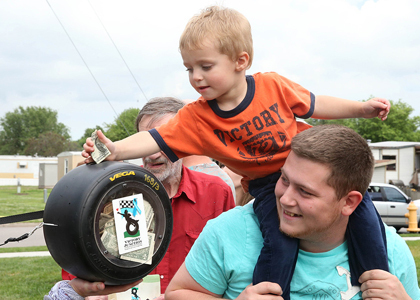 Now in its 22nd year, more than 7,750 riders have logged 11.4 million cumulative motorcycle miles and raised more than $16.5 million for Victory Junction and other children’s charities. Victory Junction is a year-round camping environment for children, ages six to 16, with chronic medical conditions or serious illnesses. Co-founded by Kyle Petty and his family in honor of their son Adam, the camp is located in Randleman, North Carolina. Victory Junction exists to provide life-changing camping experiences that are exciting, fun and empowering, in a safe and medically-sound environment, always free of charge. 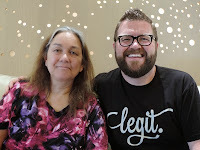 As a not-for-profit organization, the camp operates solely through the support of generous individuals, foundations, organizations and corporations to provide this experience at no charge to children and their families. Since the camp’s inception, more than 23,300 children and families have received not only a circle of support but experiences thought to only be possible by healthy children. Victory Junction is a member of the SeriousFun Children’s Network of Camps founded by Paul Newman, and is accredited by the rigorous guidelines of the American Camping Association. To learn more, please visit www.victoryjunction.org. Manheim® is North America’s leading provider of vehicle remarketing services, connecting buyers and sellers of used vehicles to the largest wholesale used-vehicle marketplace. The company helps drive dealer and commercial client success by providing physical, digital and mobile auction channels, data analysis, dealer financing through NextGear Capital, Inc., transportation services through Ready Auto Transport and a host of other products and solutions. With 80 locations across North America, Manheim registers nearly seven million used vehicles annually and facilitates transactions representing nearly $50 billion in value. Headquartered in Atlanta, Manheim N.A. is owned by Cox Automotive™ which includes industry leaders such as Kelley Blue Book (KBB.com®), Autotrader® and Dealertrack®.